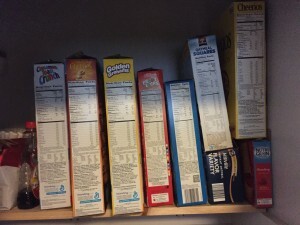 How many boxes of cereal do you have in your house right now? The number at our house varies, but most of the time we’ve got at least three boxes going, and sometimes more in reserve unopened. Right now we have a household record 7 boxes open. Lots of cereal. That’s great for a family with little kiddos who love to snack on it. 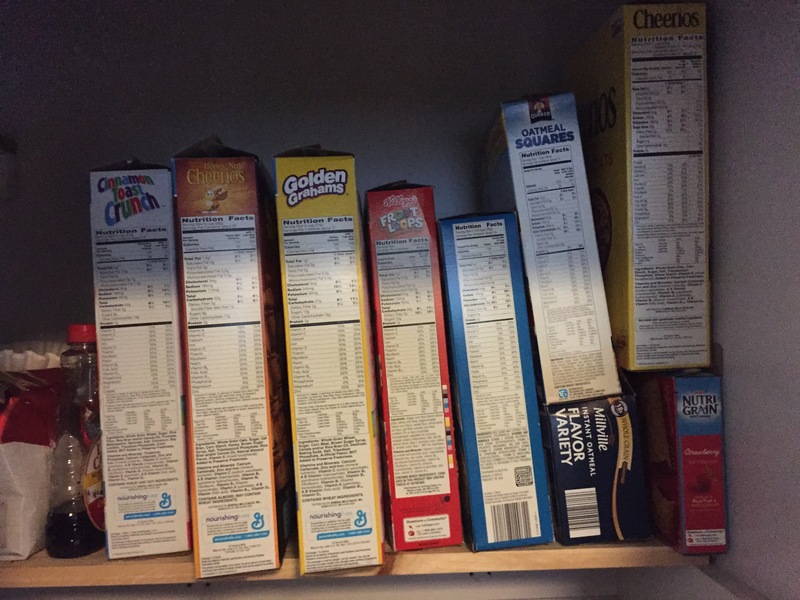 My kids are in a serious cereal kick right now. From morning ’til night it’s all they want to do — snack on cereal. This cereal fad poses a potential problem for Sophia because her brother has taken to chasing after her in an attempt to steal her cereal cup. Of course he’d rather have hers than his own. And, of course, she finds this greatly offensive. In order to help her cope with her brother’s lack of manners and social skills, we taught her just to share a piece of cereal with him when he comes hounding after her. Then he will be content and leave her alone. And so it is with our own resources coming from God our Father. He has an endless supply of whatever it is we may need. Everything in this world is his. Yet we walk around hoarding our little cereal cups, because heaven forbid we might run out! Just as my pantry is stuffed with more than enough cereal boxes to last my children many weeks, God’s storehouses are full to the brim. So why are we hoarding instead of sharing? Why are we so concerned with protecting what’s “ours”? Our fists are wrapped so tightly around our little cups of cereal. And there’s God with his giant pantry, full to the brim. We must look ridiculous. Once Sophie made the choice to share, a magical thing happened. The cereal did not run out. She made her brother happy, and their bond grew that much closer as brother and sister. 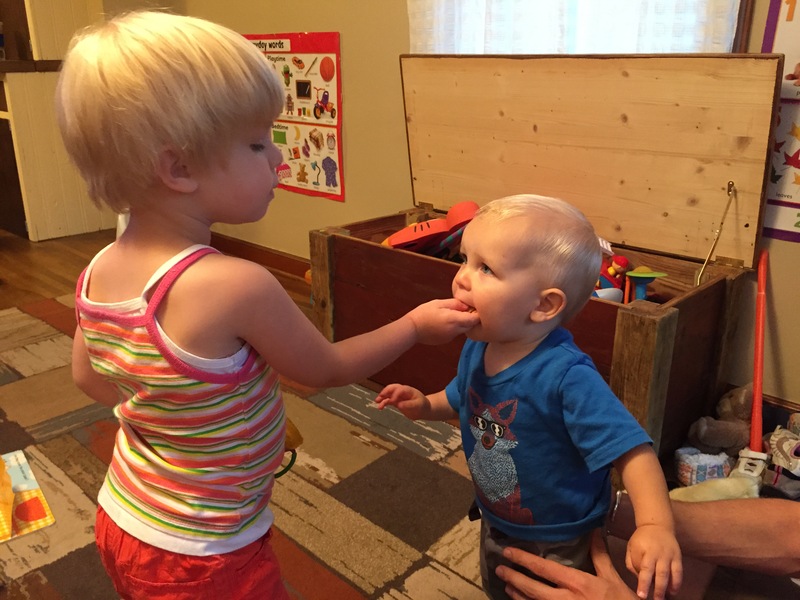 It is precious to see her take out a piece of cereal and place it carefully in his mouth. He exclaims, “MMMMMMMMM” and usually giggles. And she finds that she still has plenty to satisfy her own desires. Mommy isn’t going to let the cereal run out. What if I opened my hands? What if I gladly shared what the Father has given me, knowing that his storehouse is brimming with more than I could ever need?